Set up on December 1st 2002 by the Ministry of Culture and Cults through the County Direction for Culture, Cults and National-Cultural Patrimony Bistrita Nasaud, according to the legislation in power. This cultural institution is the work of the professor and writer Teodor Tanco, PhD, born in Monor on April 22nd 1925, the one who dedicated himself to promotion, conservation and valuing of the cultural and spiritual inheritance of the regions of Bistrita and Nasaud. His books: ,,Virtus Romana Rediviva”, in 7 volumes, ,,Soldaţi fără arme” (Soldiers without arms), ,,Lumea transilvană a lui Ion Creanga” (Transylvanian World of Ion Creanga), the autobiographical novel ,,Cândva mă voi întoarce acasă" (I’ll be back home someday), ,,Dicţionarul scriitorilor din judeţul Bistriţa-Năsăud“ (Dictionary of Bistrita-Nasaud writers), and others, prove an inquisitive spirit dedicated to promote the intellectuals of this regions and part of the historical turmoil these intellectuals lived and tried to influence according to the European world of the time. A special place in the writings of the author is saved for his birth-village, Monor, whose destiny undergoes a turning point after its becoming part of the II Border Regiment Nasaud in 1763. That status meant abolition of serfdom, investiture with the land around the village, with forests and alpine pastures, setting up of a school after 1764, all of this with positive implications in its further development. Monor is documentary attested on December 14th 1319, when, by means of a court decision from Alba Iulia, Monor together with other villages around the city Reghin are part of the inheritance divided on “good agreement” between the three sons of the nobleman Dionisie: Toma, Ştefan and Dezideriu. In Monor there were born 14 persons who obtained a PhD, prestigious personalities of the cultural and scientific life of the regions Bistrita and Nasaud, among them, Paul Tanco, PhD, the first Romanian obtaining a PhD in mathematics. For all these personalities, Prof. Teodor Tanco, PhD, found appropriate to set up this museum, consisting of an old farm-house, with aligned rooms and porch and a summer-kitchen. In this house, the first room is dedicated to the writers of the county. We have here, exposed, a gallery with 76 portraits of writers born within this area, who all, connected their names to our county, one example being the poet and philosopher Lucian Blaga. The portraits are the work of the artist Virgil Tomuleţ. In the middle of the room there stands a massive oval table on which there are exposed some of the volumes written by these writers. On another table there are exposed the 44 books edited by the writer Teodor Tanco. The middle room belongs to the author, besides it, there is a small space for a library containing over 1000 volumes. There is another spacy room dedicated to the session of the association, book releases and other cultural manifestations. 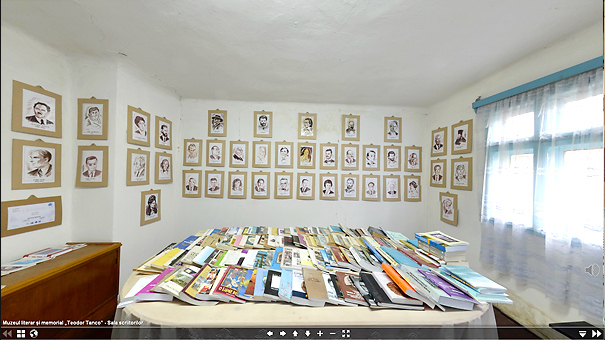 Here, on a wall, there are exhibited the portraits of the 14 personalities having obtained their PhDs, born in Monor. In the yard there stood a summer-kitchen, turned into an ecumenical chapel where there are exposed several icons painted by the icon-painter Ion Cosma from Cluj-Napoca, and an impressive number of religious books among which the Bible from Blaj – edited in 1795 and re-edited in Rome in 2000. As a memorial for the 14 PhDs from Monor, Prof. Teodor Tanco, PhD, had 8 memorial plates made, that were exposed on the houses these were born. In this space and under the supervision of the museum, during the 8 years of activity, there were organized here over 20 book releases. Among the writers present here, we should enumerate: Teodor Tanco, Ioan Vlaic, Cornel Cotuţiu, Viorel Rusu, Nicolae Feier, Radu Lucaci, George Echim, Teodor Echim, Dimitrie Poptamas, Şerban Melinte and others. Din Monor s-au ridicat în timp 14 doctori în ştiinţe, personalităţi culturale şi ştiinţifice marcante ale ţinutului bistriţean şi năsăudean, dintre care evidenţiem pe dr.Paul Tanco, primul român doctor în matematică.